The events of Verity aren't ever far from the surface, particularly when you consider what would have happened to Julie had Maddie and the French Resistance not intervened. Inevitably, the two books are going to be compared, which I think is unfair to Rose Under Fire. Rose is a quieter book, without the mystery and puzzle pieces of Verity, or the jaw-dropping sobbed-for-hours twists. That doesn't make it a bad book, far from it, but if you're going in expecting something that's going to rip your heart out and then slowly knit it back together, you may have a different experience with this one. That said, I loved Rose Under Fire. Rose, our main character, is a young pilot from America (Pennsylvania, to be exact -- her family's roots are Pennsylvania Dutch. I bet Rose says "crick" and "gumband" like I do.) who has some strings pulled to get her into the ATA to fly transport planes in England during the war. It's through this work that some familiar faces from Code Name Verity pop up and we get to check in on how they've been doing since the close of that book. Rose's narration keeps the story relatively lighthearted until she gets captured by the Germans and sent to a concentration camp. There, things turn grim, but even in the darkest of moments, Rose rarely gives up hope that somehow, the situation for her and her fellow detainees, will improve. Overall, this is another strong story about friendship, and awesome ladies doing awesome things. Rose and the "Rabbits", a group of Polish women who suffered due to cruel medical experiments while imprisoned, may not always see eye to eye or even speak the same language, but when the situation starts to get dire for them, they band together to try to make sure that they make it out alive and that the world will hear about the atrocities they had lived through. Rose and company grow and change throughout the story, which we see mostly from Rose's perspective, looking back at the events after they occurred. Rose and the Rabbits grow up, become women, and become survivors. 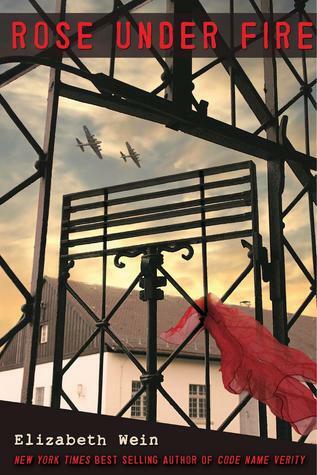 Unlike Code Name Verity, Rose sticks around to show the reader the aftermath of Rose's time in Ravensbruck, which were some of the most poignant scenes for me. There is a lot of profanity in the book, and there was one scene where Roza, one of the Rabbits, explains the gruesome medical experiments that she was subjected to, which made me fairly queasy, and I generally consider myself pretty un-moveable. That said, I would recommend this book to any reader, particularly those with an interest in World War II history. I would have loved Wein's writing as a teenager, but I think I appreciate it even more as an adult, with a more mature understanding of the horror of World War II. As Wein discusses in her afterword, sometimes it's hard to understand why we need to invent new, futuristic dystopian worlds, when we've got enough real world horror with the Holocaust. Wein's afterword is well worth a read, particularly regarding the research that she did for the story, as well as references to the real-world women who inspired certain characters amongst the Rabbits. I'm actually in the middle of reading this. So far, I'm liking Rose as a character, and I'm fascinated by the whole WWII aspect. I was not aware about the "medical experiments" thing, so I'm slightly wary for it when it comes.